41 year old male presented to the hospital with increased sleepiness, impaired memory, and impaired verbal interactions. CT scan showed a left frontal brain mass which led to craniotomy. No prior history of malignancy is reported. DIAGNOSIS: GIANT CELL GLIOBLASTOMA (WHO GRADE IV). Sections show numerous pleomorphic giant cells, including many multinucleated forms, with extensive necrosis, and brisk mitotic activity. Immunoperoxidase stains show positive staining with Olig-2 and p53. Positive ATRX is present and Mutant IDH1 is negative. 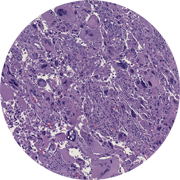 Giant Cell Glioblastoma is a rare subtype of Glioblastoma, representing approximately 2-5% of Glioblastomas. This tumor tends to occur in younger patients with a median age of 51 years at time of diagnosis. Giant Cell Glioblastoma is thought to have a better prognosis than classic glioblastoma.